Fulcrum Tap Light, Versatile, Series: Light-It, LED Bulb, 9 Bulbs, Flood Beam, 40.5 lumens, 100000 hr Average Life, Alkaline Battery, AAA Battery, 3 Batteries, White Body, Includes: (3) AAA Batteries, For Any Dark Space, Closets, Cabinets, Boats, Rvs and More Mounts anywhere, adhesive backing. 13.5 lumens. Tapping the center of the light turns it on/off. Uses 3 AAA batteries (not included). Mounts anywhere, adhesive backing. 13.5 lumens. Tapping the center of the light turns it on/off. Uses 3 AAA batteries (not included). Versatile, extra bright. 40.5 lumens. Included adhesive strips and integral mounting bracket. Once installed, the light can be detached from the bracket for handheld use. Uses 3 AAA batteries (not included). Anywhere light, 20-LED, portable, 80 lumens. Uses 4 AAA batteries (not included). For spaces that need extra-strong light. 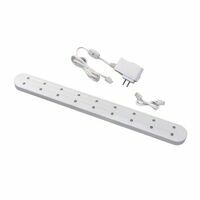 It fastens easily onto the wall or under a cabinet with tape or screws (included). 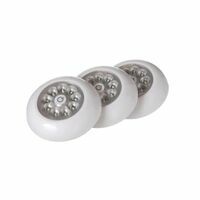 Reliable, energy-efficient LEDs make it a good choice for power outages and emergencies. Clear flexible tubing, 3/8" diameter incandescent. Non replaceable bulbs included. For indoor or outdoor use. Sets can be connected end to end. 120 volt. 35,000 hour bulb life. Super slim linking under cabinet light with white acrylic diffuser. On/off switch. Plug in only. 6" connector cord. 5' power cord with a 2 prong polarized plug. 10000 hours average lamp life. Bulb is included. Color changing, flash, strobe, fade or smooth transitioning of light. Two-2 foot strips, residential grade. Adhesive mounting. One-3" universal connector. RoHS compliant, cULus Listed. Fluorescent white metal under cabinet light, 15 watt, 120 volt. Uses 1T8 bulb. Direct wire applications. Includes on/off switch and mounting hardware. UL listed. Uses standard F15T8 replacement bulb. General purpose fluorescent light, 5' cord, 15 watt F15T8 fluorescent bulb included. White non-metallic case. On/off switch. 18" length x 3.25" depth x 1.875" height. White finish under counter grow light with on/off switch. 22" long x 1.875" deep x 2.25" high. Non-metallic case. Plug in only. Uses one F15T8 linear fluorescent bulb, included. Micro halogen spot light. 6" height, 3.2" base diameter and 5' cord set. Uses GU10, MR11, 10 watt, 120 volt halogen bulb, included. G4 base. Portable, mounting bracket, motion or on/off. 65 lumens, 3 AA batteries (not included). Comes with an adhesive strip and optional angled mounting bracket enabling it to be installed anywhere. 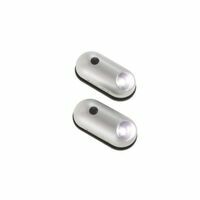 It features an optional motion sensor, and detaches from its bracket for hand-held use. Broad beam of light. AmerTac Undercabinet Light, Series: Westek, 120 V, 15 W, FA315CB Fluorescent Lamp, T8 Lamp Base, 5 ft Power Cord Power, 8000 hr Average Life, Warm White Light, Plug-In Mounting, 1-1/2 in Overall Height, 3-1/2 in Overall Width, 18 in Overall Depth, Plastic, Includes: Mounting Hardware, For Utility Room and Workshops Super slim linking under cabinet light with white acrylic diffuser. On/off switch. Plug in only. 6" connector cord. 5' power cord with a 2 prong polarized plug. 10000 hours average lamp life. Bulb is included. One-touch on/dim/off with ambient light sensor. Head pivots 30 degrees and swivels 360 degrees. Installs with the included screw or hooks and loop tape. Each light takes 3 AAA batteries (not included). 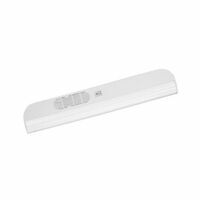 3.25" L x 3.25" W x 2.25" H. White finish single light fluorescent fixture. 22" length x 1.75" depth x 2.15" height, 5' cord set. Non-metallic case. On/off switch. Plug in only. Uses F15T8 15 watt fluorescent bulb, included. Uses T8 bulb, replaces current T12. High-color retention. Convenience grounded outlet. On/off switch. 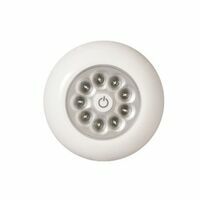 Plug-in, T8 series, white. Bulb included. AmerTac Undercabinet Lighting, Ultra Light, 120 V, Fluorescent Lamp, 8 W Lamp, 6 ft Power Cord Power, 8000 hr Average Life, Warm White Light, Plug-In Mounting, 13 in Overall Height, 1.63 in Overall Width, 1 in Overall Depth, Plastic, White White finish, clear acrylic diffuser. Uses high-efficiency T5 bulb with twice the lumens per watt. Offers super slim profile and high color retention. Electronic ballast for instant-on, flicker free. On/off switch. T5 series. Bulb included. cULus Listed. Clear flexible tubing, 3/8" diameter incandescent. Non replaceable bulbs included. For indoor or outdoor use. Sets can be connected end to end. 120 volt. 35,000 hour bulb life.